WELCOME TO THE KINGDOM OF LAKES AROUND KUFSTEIN! 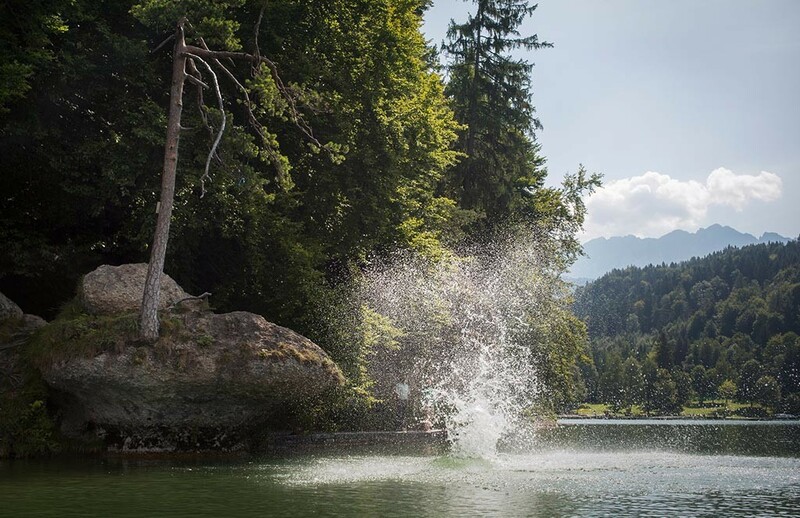 You will come across plenty of options for cooling down and lakes around Kufstein and its surrounding area. HEXENWASSER LEISURE PARK IN SÖLL, IN HOCHSÖLL AND ON THE HOHE SALVE! In the water-filled, cheery natural adventure area “Hexenwasser” in Hochsöll even cool youngsters will forget that they didn’t want to go hiking. Reservoir basins, water channels, climbing ponds, mud basins, fire pits – more than 60 stations in total – will mean that nobody gets bored. Parents can get inspired in the Kneipp pool or on Austria’s longest “barefoot trail” and massage their reflex zones heading over the grass, mud and stones. An additional highlight is the unique panoramic view from the Hohe Salve to 70 peaks which are over 3000 m.
Thiersee not only inspires swimmers, but sun-worshippers and families too. The upgraded bathing beach area has a beach volleyball pitch, a diving platform and an aqua jump. For the little ones there is a large newly built play area which provides plenty of space to run about on. A restaurant in the bathing beach area tempts swimmers and walkers in for a rest and to enjoy some food. Row boats and pedalos are available to hire at the bathing beach. The east bathing beach also has another superb sun lounger area. Insider tips for those who prefer things to be a bit more sedate. The locals like to visit the swimming pond. While parents get to indulge in the café, little ones get to really let off some steam out on the play area, on the aqua jump and on the water slide. 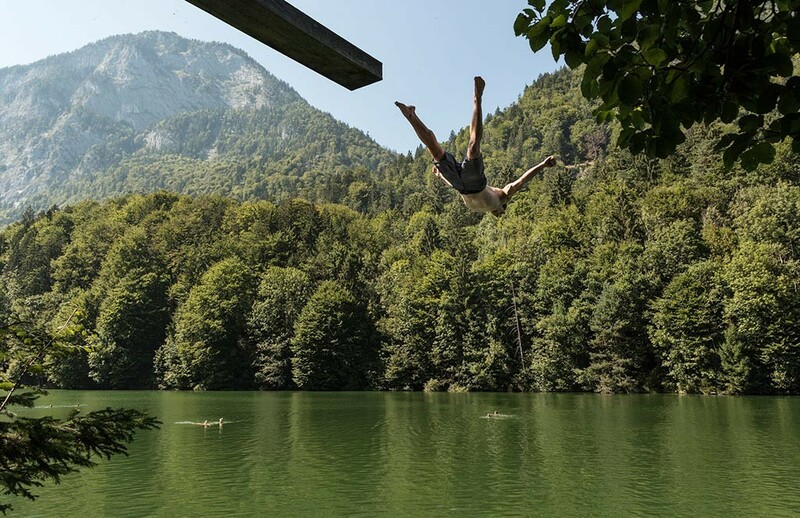 Hechtsee is one of the most popular swimming lakes for the people of Kufstein. The large sun lounger area provides lovely places to relax and unwind. Numerous trees provide the requisite shade so you can even enjoy the hot summer days. A self-service restaurant, which has a terrace opposite the sun lounger area, sees to your corporeal well-being. Those for whom swimming is not enough, will be very well catered for on the recently set-up beach volleyball courts or on one of the table tennis areas. Boat trips tempt you to explore the mountain landscape from the water. Little guests can really let off steam on the play area. Idyllically located between Kufstein and Langkampfen, at the foot of the Pendling, is Stimmersee. The best water quality ensures unadulterated swimming fun. The flat access area to the water means that even the little ones can enjoy splashing around safely. You have the opportunity to get some food in Gasthaus Stimmersee. The small and lovely Waldsee lies 100 metres high above Kufstein. Well-known for its idyllic tranquillity and great water quality, Pfrillsee is also a very popular hiking destination for hikers. Pfrillsee is freely accessible to the public and can be used free of charge. A swimming pool and adventure pool await. The large water slide and the three-lane slide also provide plenty of fun and action. There is also a children’s pool, an elephant slide, a knight’s tower and the little Hallo Du mascot, as well as a children’s slide and a large play area. The two beach volleyball areas which have their own beach soccer pitch are key features. A covered sports area for all kinds of ball games as well as inline hockey, street hockey and a fun park are also available. The first biotope swimming lake in Tyrol opened in the summer of 1998 in Schwoich. The facilities are right at the edge of the forest and not only offer swimming guests the opportunity to swim in crystal-clear water which is drinking quality level, they also provide the chance to walk around the wonderful ‘Bananensee’ (or ‘banana lake’ – named this by the locals on account of its shape). Water lovers will enjoy themselves in the splash pool, in the children’s pool which has currents and a water hedgehog, water slide, water cannons and a play pond area. In the swimming and adventure pools, 4 swim lanes await covering 25 m, and featuring a massage seat and loungers, a fountain shower, rainbow fountains and current channel. There are also beach volleyball courts and a sports and football pitch. The buffet area which has a large covered terrace area will ensure you don’t go hungry. There is also a large children’s play area there.